Today, May 8, 1945 is known as 'V-E Day,' marking the surrender of Germany and the Axis powers in Europe. 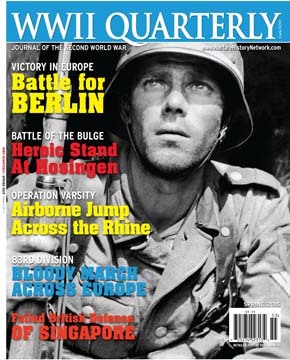 Spring 2015 edition of WWII Quarterly. There was no more rattle of machine guns; no more pop-pop-pop of small arms; no more whistle of falling bombs; no more visceral thud of incoming artillery shells; no more screams and shrieks of soldiers and civilians caught in war’s merciless grip. It was a deep and profound silence that came over Europe, punctuated only by the tolling of church bells (in those places where churches, with their bells intact, still stood) announcing that peace, after nearly six years of continuous bloodshed, had finally returned to the Continent. The surviving soldiers and civilians on all sides took a moment to get down on their knees and offer thanks that they had been spared, and to say a prayer for the 50 to 60 million people around the world who had not been so fortunate. In places like London, Paris, New York, and Moscow, massive celebrations took place to mark the end of the war. People danced in the streets, kissed strangers, waved flags, showered flowers and tons of confetti down on ranks of marching soldiers, and, for a short while, partied like they had never partied before. Winston Churchill, Britain’s wartime leader, said, “We may allow ourselves a brief period of rejoicing; but let us not forget for a moment the toil and efforts that lie ahead. Japan, with all her treachery and greed, remains unsubdued. The injury she has inflicted on Great Britain, the United States, and other countries, and her detestable cruelties, call for justice and retribution. Then came the rebuilding process. Putting Europe back together would be an immense, staggering task, unlike anything that mankind had ever faced before, just as the war had been on a scale unlike any conflict the world had ever seen. Refugees would have to be resettled, millions of prisoners of war sent home, the sick and wounded restored to health, cities and infrastructure rebuilt, new forms of government established, and the Nazi war criminals hunted down and put on trial. I still have a dim memory, as a young boy, of my mother taking me down to the local bus station in Hammond, Indiana, to greet my father coming home from the war. I was too young to appreciate the significance of the moment. I only recall my mother hugging a tall man in uniform and crying; I did not know who he was, or why she was crying. I would soon learn. On this, the 70th anniversary of the war’s end, it is good and right for us to remember V-E Day, even if not all of us had been born at the time. Chances are, mankind will never see its like again. Tags Adolf Hitler, adolf hitler and benito mussolini, Allied Expeditionary Force, artillery, Benito Mussolini, Britain, Britannia, CIA, EAM, Europe, fascist, Fascist italy, German, Germany, Great Britain, india, Italy, Japan, london, machine gun, May 8 1945, Moscow, Mussolini, Nazi, New York, Paris, Rangers, SHAEF, Surrender of Germany, Third Reich, Tory, United States, V-E Day, War Correspondent, war in europe, Wii, WIN, Winston Churchill, wounded, WWI, WWII, WWII Quarterly.